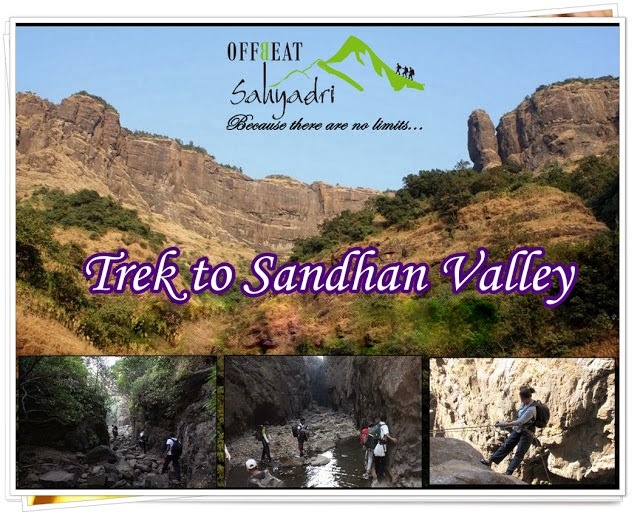 We invite you to a trek to Sandhan Valley on 15th of December 2013, starting on 14h Night. This is gonna be a memorable event as it’s a completely different trek. Here we wont be hiking a fort or a pinnacle but what we are going to visit is 2 km long natural gorge formed by the force of flowing water. It’s a kind of experience to walk through this 500 ft deep narrow gorge where in one has to tackle uneven rock patches, patches where in one has to cross water pools as deep as 4 ft.
It’s a complete adventure package as we will be rappelling down 3 rock patches. Transportation from Kasara to Asangaon . 1 Break Fast + 1 Evening refreshments + Trek expertise.